xoxoBlythe is proud to be a part of PuchiCollective, a site dedicated to the world of alternative dolls and the community that loves them. 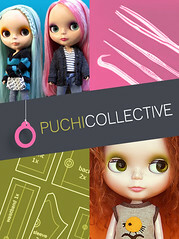 Formerly Puchimadam.com, the new PuchiCollective will have more sewing patterns, interviews with Blythe fashion designers, tutorials, tips and tricks and more. Please update your bookmarks for more Blythe fun!